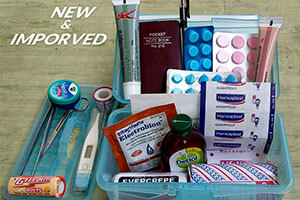 First Aid Samll Plastic Box (size: 7.5 by 4.5 inches) New And Improved with additional products but in same price- Original Price Rs. 1500 [Offer Price Rs. 1350] Suitable for home use First Aid Contents Inside 1 digital Thermometer 1 tweezers 1 Scissors 1 Glucose Tablet packet of 9 tablets 4 Band aids 1 cotton roll 1 Gauge pad 1 adhesive cloth tape 1 antibiotic ointment 1 roller bandage 1 Antiseptic Disinfectant 1 strip Antacid 1 strip Paracetamol 1 Strip antidiarrheal tablets 1 Vicks vapour rub small 1 Crepe Roller Bandage 1 pain relieveing massage cream 1 ORS Solution (Jeevan Jal) 1 pen to write important numbers like ambulance, hospital, doctors etc.